It all begins with a letter. Fall in love with Penguin Drop Caps, a new series of twenty-six collectible and gift-worthy hardcover editions, each with a type cover showcasing a gorgeously illustrated letter of the alphabet by superstar type designer Jessica Hische, whose work has appeared everywhere from Tiffany & Co. to Wes Anderson's film Moonrise Kingdom to Penguin's own bestsellers Committed andRules of Civility. A collaboration between Jessica Hische and Penguin Art Director Paul Buckley, the series design encompasses foil-stamped paper-over-board cases in a rainbow-hued spectrum across all twenty-six book spines and a decorative stain on all three paper edges. Penguin Drop Caps debuts with an “A” for Jane Austen’s Pride and Prejudice, a “B” for Charlotte Brontë’s Jane Eyre, and a “C” for Willa Cather’s My Ántonia, and continues with more classics from Penguin. 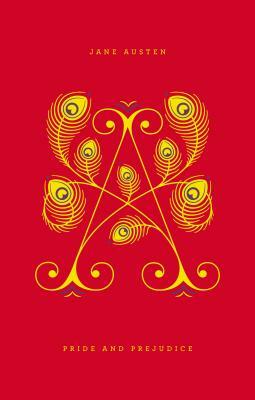 A is for Austen. Few have failed to be charmed by the witty and independent spirit of Elizabeth Bennet in Austen’s beloved classic Pride and Prejudice. Elizabeth’s early determination to dislike Mr. Darcy is a prejudice only matched by the folly of his arrogant pride. Their first impressions give way to true feelings in a comedy profoundly concerned with happiness and how it might be achieved. Jane Austen (1775–1817), the seventh child of a parish rector, is one of the most celebrated writers in the English language. Jessica Hische is a letterer, an illustrator, a typographer, and a web designer. She currently serves on the Type Directors Club board of directors, has been named a Forbes magazine “30 under 30” in art and design. She lives in San Francisco, California, and Brooklyn, New York.